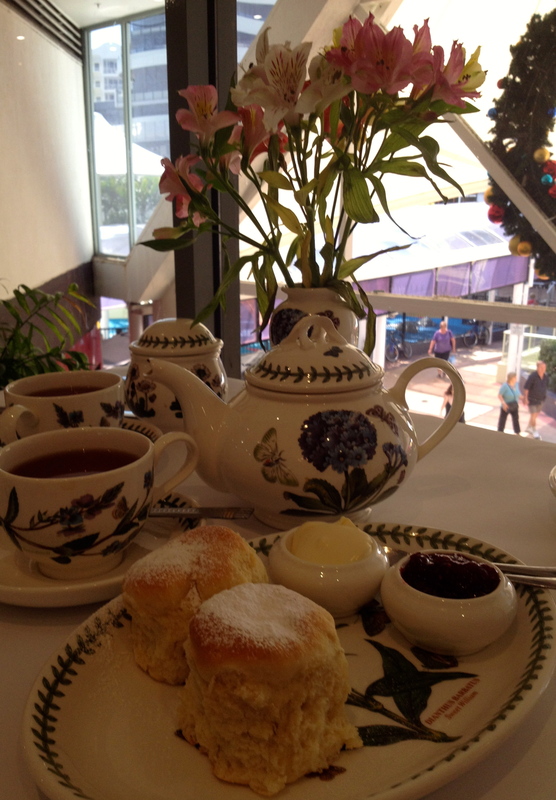 You wouldn’t think to find a tea room in the middle of a popular beachside shopping mall on the Gold Coast. CreativiTea is a combination lunch cafe/tea room that specialises in High Teas, Devonshire Teas and any sweet something you may be hankering for. The extensive tea menu is bound to have something you haven’t tried, with the homeware shop on the premises stocking many of the teas. We’re lucky to have a table with a view, although it only overlooks a cafe and kiddies playground on the mall, it’s a view nonetheless. The crockery isn’t the dainty kind you’d expect in a tea room, but the fauna and flora prints and cute teapot definitely add the feminine touches. The scones are fluffy but slightly dry, if that’s possible, the Grainge jam tasty and the cream thick. Overall, my tasting companion and I decide, for the price, it could be better. If you’re in the market for a new teapot or cups and saucers, you’ll be happy with the range. Tea: A vast selection of all types of loose-leaf tea served in a good-sized pot. Overall: If you need tea and tea pots, this is the place. 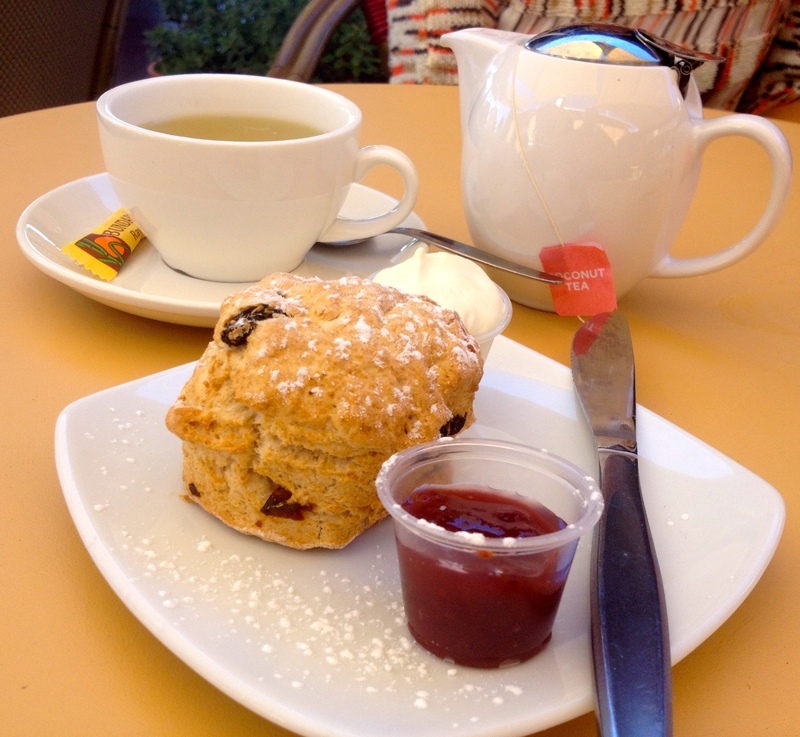 On the road to Springwood in the Gold Coast’s hinterland, Polly’s Country Kitchen spruiks its fresh-baked scones to lure in passersby. The old-style music, plastic chairs and tablecloths make for an unpretentious cafe in a region that pretense is everything. The menu oozes simple comfort food and their homemade scones reflect this. Surrounded by extensive well-kept lawns, it’s also a wedding venue and has a casual undercover dining area down by the gurgling stream. I love how my scones are served on a breadboard – very homey and they taste as fresh as the sign promises. The jam and cream are nothing extraordinary, but the scones are the highlight here. And the ‘too’ friendly kookaburras, which have made it their mission to share your meal. Overall: A relaxed cafe far from the Gold Coast crowds. Hidden at the end of a small arcade on one of the shopping strips in North Tamborine, the Red Flame Tree Cafe is one of those cafes you need to look a little harder to find, as it’s not on the usual tourist trail. For one, it’s closed on weekends, which is a sure sign that it’s a big hit with the locals during the week. We manage to grab a Devonshire Tea just before closing time and sit in the courtyard that’s more or less a wider part of the arcade at the front of the café. The scone, at 4pm in the afternoon, is dry and has a very sweet smell, perhaps from being heated. The strawberry jam is average and although the cream is fresh, it is super-duper light. Open Monday to Friday. Tea: The usual choice of Nerada tea bags served in a good-sized teapot. Overall: A quiet café tucked away far from the tourist crowds. Tea & Niceties is far away from the tourist strip in Eagle Heights and is surrounded by lush forest and pretty gardens, and is geared up specifically for special events, namely weddings. The restaurant or interior seating, feels very formal with white tablecloths and beautifully set tables, but if you want to catch some sun or a breeze, sit in the courtyard under an umbrella. My friend and I are impressed with the spread; swanky silverware, gorgeous tea ware, good quality tea and scones, jam and cream that surpasses anything we’ve tried up on the mountain. The scones are a bit dry and crumbly but are tasty nonetheless. The mixed berry jam is quite average, neither good nor bad, and the dollop cream is thick and rich just as dollop cream should be. 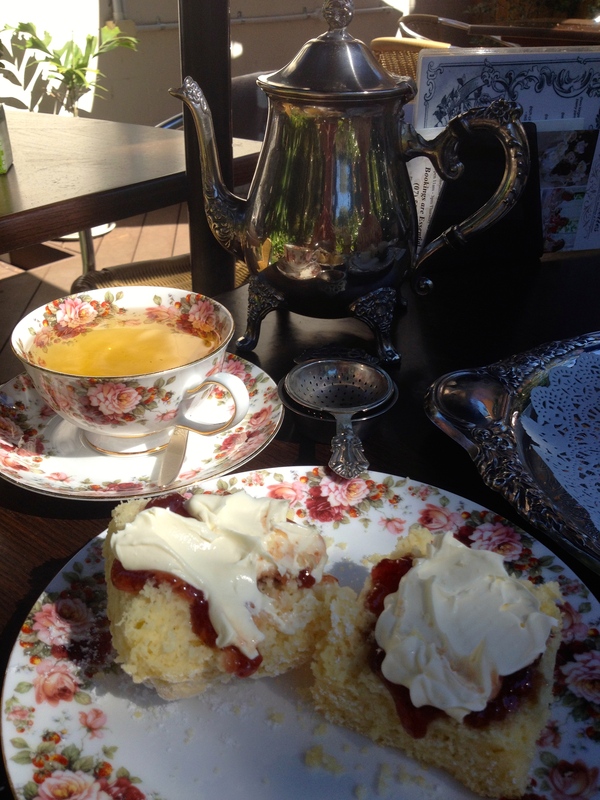 Although not one feature is perfect, apart from the crockery, tea and teapot, once all put together this is one Devonshire Tea that shouldn’t be missed when visiting Mt Tamborine. Closed Monday and Tuesday. Tea: 18 varieties of loose-leaf teas from Tea Centre served in a magnificent silver teapot. Overall: A sophisticated Devonshire Tea not to be missed. 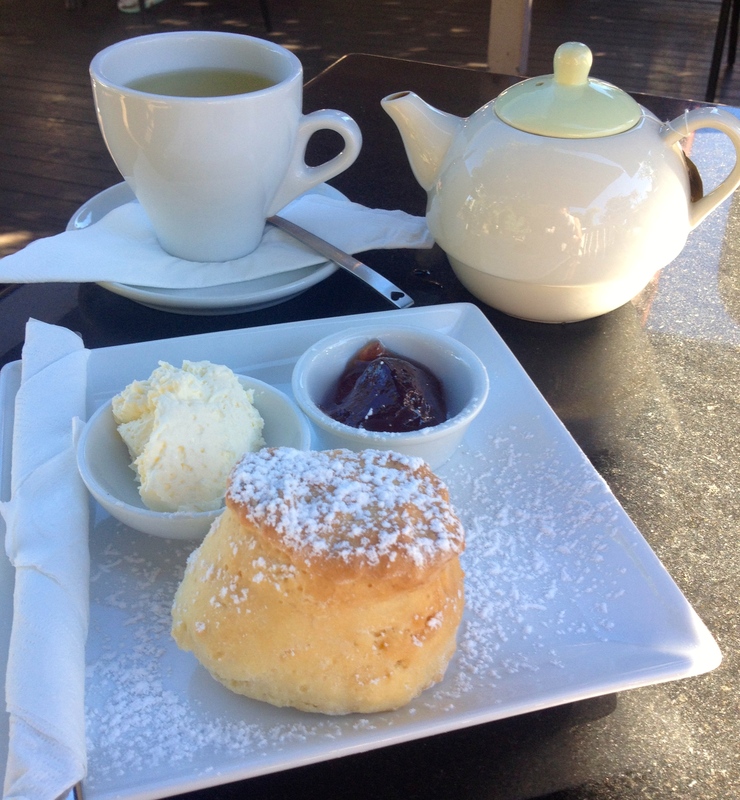 The Tallebudgera Valley is the perfect backdrop for tea and scones, and what better place to have them then Teavine House. Teavine House is airy and open, the serene setting is exactly what you would expect somewhere semi tropical like the Gold Coast. There’s a small verandah along the front, otherwise indoor is perfectly comfortable; high ceilings, decor in cool whites and timber floors – you can see why it’s a favourite wedding venue. The intimate marquee out on the back lawn is lovely, and a visit to the bathroom is an interesting trip in itself. Shoppers will enjoy the on site boutique and tea lovers the choice of teas. I potter around the restaurant looking in glass cabinets and admire the myriad cups and saucers, loving the blue polka dot ensemble that lands at my place on the table. 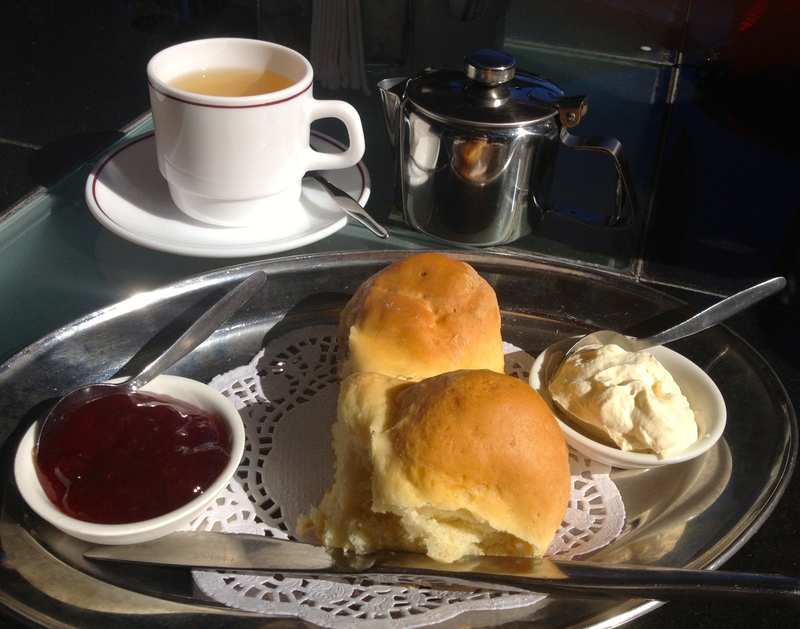 Initially, my friend and I share a Devonshire Tea, but it’s so good that we order another. A perfect size for that ‘in-between’ snack, the scones are soft and fluffy and slightly crispy on the outside. The rich raspberry jam and freshly whipped thick cream are the perfect accompaniment. Tea: A large selection of loose-leaf teas served in a cute teapot. Overall: It should be called ‘Divine House’. The sign out the front of The Gallery Cafe says that their Devonshire Teas are famous. Who decides this, I don’t know, but I’m scratching my head trying to work out why, as I’ve just come from two other places that you could definitely say that. The Gallery Cafe is your typical tourist café on a very touristy strip in Eagle Heights. When I arrive it’s empty. It’s not quite 2pm and already the ‘closed’ sign is about to go up, which doesn’t really give you much time to try the famous Devonshire Tea. The inside of the café is cavernous and bright, and would be toasty warm on a cool winter’s day. At one end there is an area posing as a gift shop selling goods geared to the tourist trade. I settle in the large leafy courtyard out the front, happy for some autumn sunshine and mountain air. There’s something about my scones being served on a metal tray that irks me. It feels clinical, soulless even. The scones are light and soft, nice enough but are a bit like sweet bread rolls. The strawberry jam is sickly sweet (low quality?) but I love the thickly whipped fresh cream that basically makes this Devonshire Tea good enough – but – definitely not famous. Closed on Thursdays. As soon as we sit down, a tray of small jars containing black, green, fruit blends and herbal loose-leaf tea arrives for us to sniff and select. We’ve barely gotten over our first impressions of the wonderfully kept old Queenslander when our senses are overwhelmed, intrigued and duly impressed by the choice of tea. There’s plenty of room with tables out the back, on the front verandah and scattered in the garden, and by the sounds of things it can and does, get mighty busy. It’s easy to understand why as it’s the perfect setting for tea and scones, and I almost feel I could be in exotic colonial Africa or Asia. The little touches; the dainty teacups and teapots, and my friend comments on the use of wine glasses for water, makes for a lovely experience. 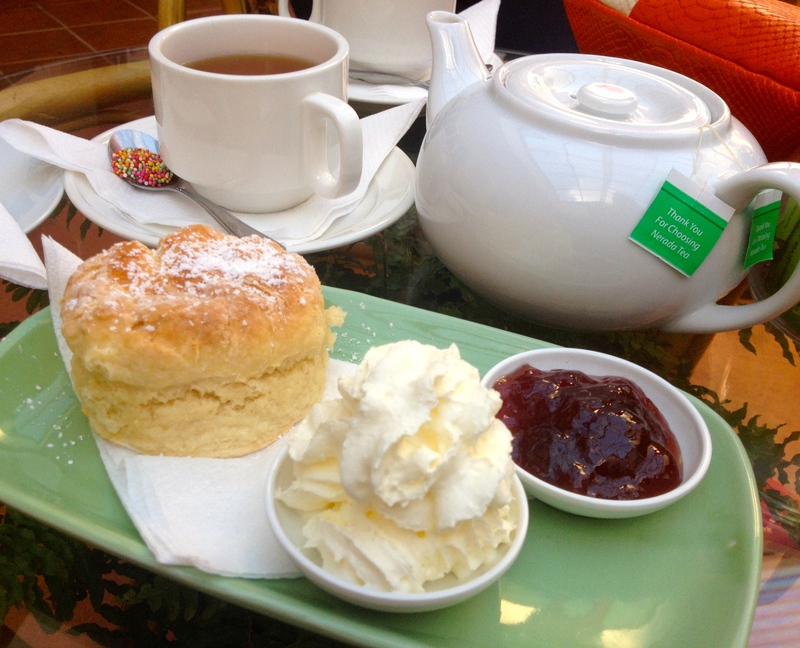 Choose from either the traditional plain scones, date served with butter, or ginger scones served with ginger conserve. I try both the plain and ginger, and if you’re a ginger fan, you’ll like them. The scones taste fresh and buttery but are quite small – perfect for a High Tea, but not substantial enough for a Devonshire Tea, and, both my friend and I agree, could be better. The raspberry jam is thick and rich and the freshly whipped cream has been cooled in the fridge so it far from slides off your knife – nice! Opening hours are limited to Friday from 11am to 2.30pm, and Saturday/Sunday from 10am to 4pm. Tea: A vast selection of loose-leaf teas served in a good-sized pot. Overall: An impressive setting reminiscent of historic times. We tried tea and niceties today and would have to say the service was average, the scones were average and the jam and cream were also both average! The best place on the mountain by far and I have been everywhere is cedar creek winery! Their scones are made fresh and are delicious, their cream with cardamom pod is delectable and the jam fresh it is definitely the place for scones that tantalise your tastebuds! Thanks for sending through your thoughts on Tea and Niceties. That’s the thing with cafes and restaurants, the product can change so much depending on the staff or any changes in the business. 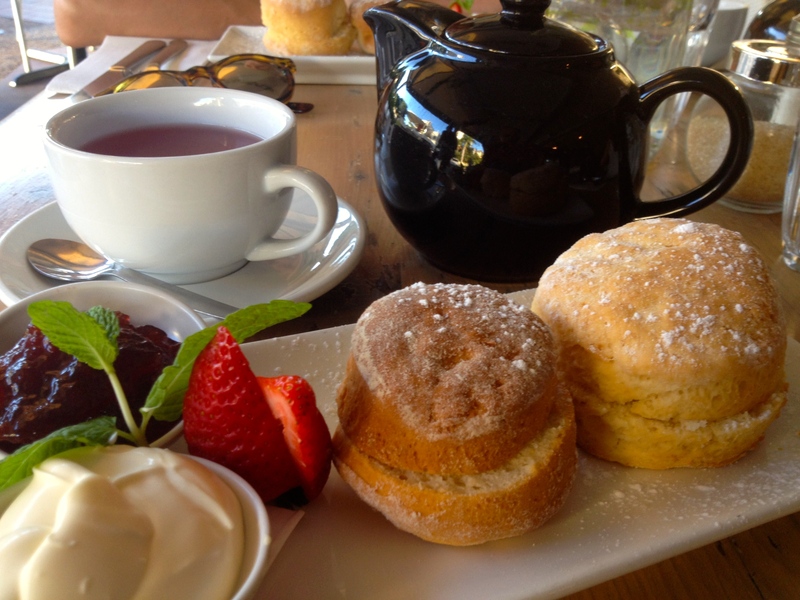 I missed out on the scones at Cedar Creek Winery, it’s on my list for next time! 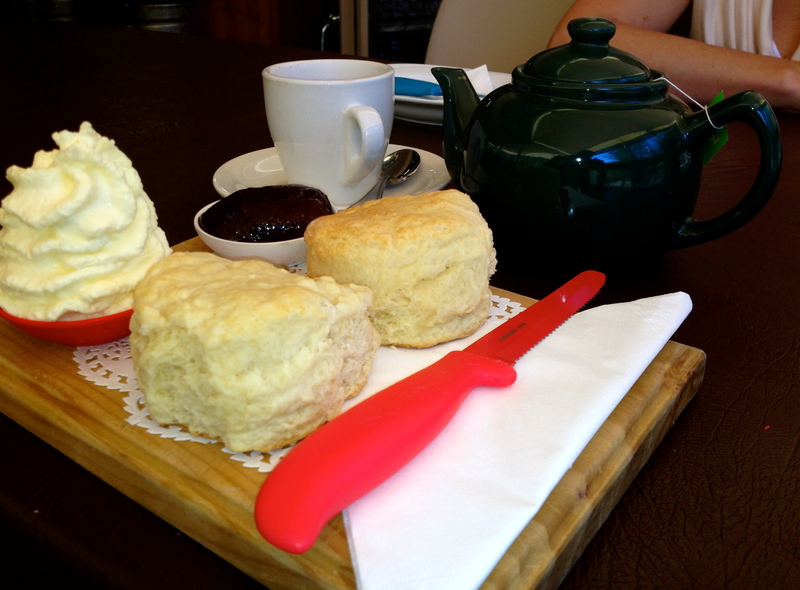 Great reviews thank you – as a Devonshire tea devotee it’s great to find another addict. 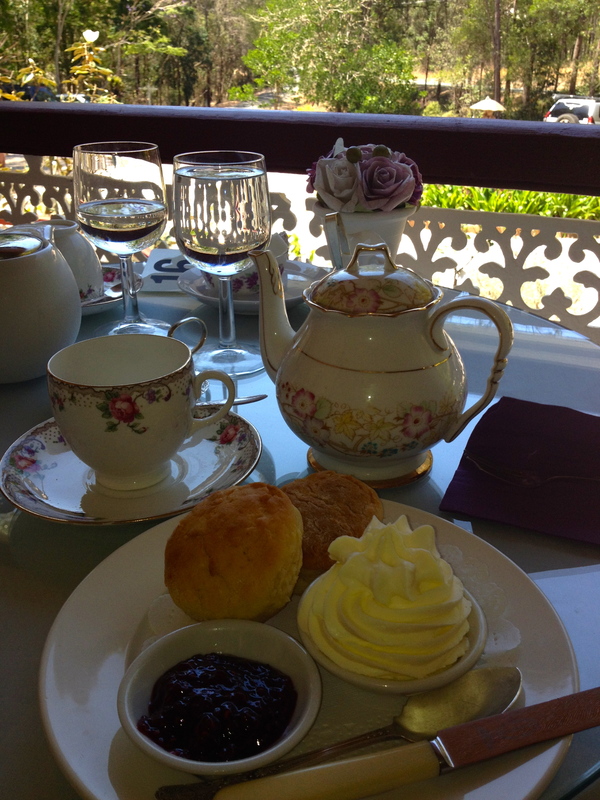 My family and I had a lovely Devonshire tea experience at Tea and Niceties. We loved the tea and scones so much we ordered two more plates of them, including my fussy teenage son and a 6 year old who doesn’t eat jam. Beautiful gardens with pretty birds trying to join your lunch and an easy rainforest walk just beyond the back fence to walk off the calories. Gets my vote as one of the best DT experiences in the SE corner of Queensland. You’ve mentioned some other places we’ll have to try – it’s really hard to find the prefect scone, jam, cream and tea combination. Having just got back from trying lots of DT’s in London following people’s web reviews, it’s hit and miss back in the old country too. Thanks for you email and sharing your DT experiences. Good to hear that Tea and Niceties did well, as sometimes food and service hence can be an unreliable marker when judging a place. Plus experiences can differ so much from person to person. Yes, I totally agree regarding finding a great ‘all-rounder’. Some places do great scones, but serve lousy jam and cream with them. I’ve probably only had a handful of DTs that have done everything well, including the tea! Have you been to Devon Pixies in Logan Village? They do a great spread! I was in the UK in late 2015, and I managed over 30 DTs. One I relly like was The Four Teas in Stratford-Upon-Avon, and 1940s themed tea room, and a beautiful tea room in Galway in Ireland. Yes, hit and miss. All the ones in London, although they had clotted cream (bonus), were served at room temperature, which a British friend tells me is the norm, and generally mediocre. I haven’t managed to post all of those reviews on my website yet, as I focus more on the Antipodean take on Devonshire Teas! Lovely to chat Jane, and if you come across a place that I haven’t reviewed, please let me know. 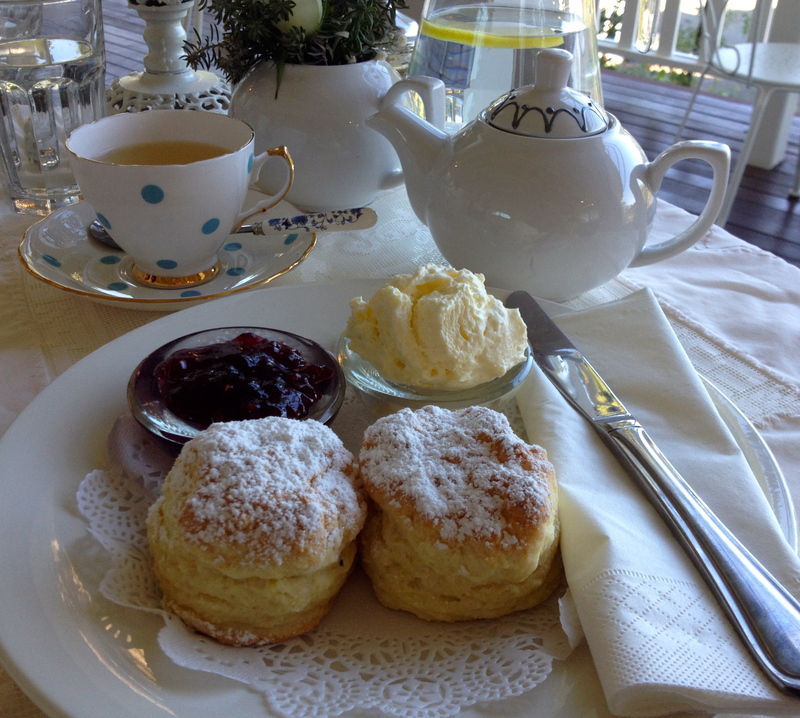 Really loved this website, can’t believe how much info I got after googling scones Gold Coast. I was looking for somewhere different to take some visitors and the info here helped alot. Now I’m off to try some scones from places I didn’t know existed. Thanks Owen.